The diagnostic skill of a technician in the Automotive Industry is one of the key attributes which sets aside the top-performing, most valuable members of technical staff from the rest. Skilled diagnostic technicians are a valuable asset in the Industry and most people who can demonstrate this ability are high-achieving Master Technicians who have the most interesting and challenging careers. Diagnostics skills are a combination of applied knowledge and experience, logical thought process, in combination with an inquisitive nature. That is, the instinct of a technical mind to understand how something works. A logical approach to fault finding is essential to avoid wasting time and money. If a fault occurs on a vehicle which is a known problem or you have come across before. Then, using your experience, you can optimise your time spent rectifying this fault as you have some direction. 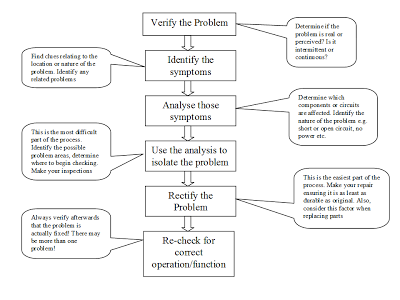 The diagnostic skill becomes apparent when you are looking at a problem you haven’t seen before. In this situation, many Technicians resort to changing component parts blindly, this is not acceptable for modern vehicles as these parts can be very expensive. A starting point is to use some method or philosophy to approach the problem. A simple but logical, generic process (as shown below) puts a structure behind your actions. 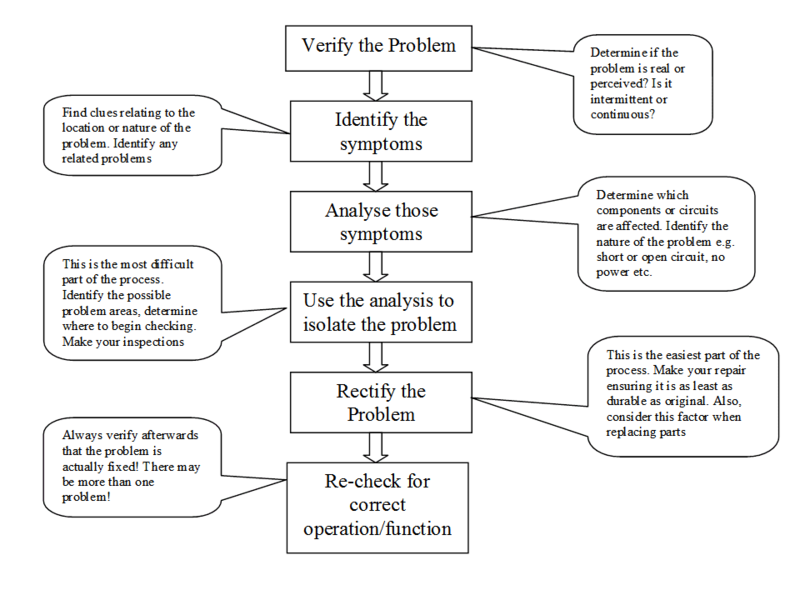 Fig 1 - Successive Approximation - a logical fault-finding process! This method allows you to successively, physically check parts of a wiring circuit, in a logical way such that with each check, you will definitely get closer to the fault. This reduces the amount of time spent tracing faults electrical faults in the vehicle wiring system. If the circuit layout is not known, or is complex, then a wiring diagram will help considerably. The principle involves finding the ‘middle’ of the offending circuit path. Form this point you can check which side of the circuit has failed with the appropriate test tool. Once you identified this, you have immediately reduced the size of the problem by half! Next, you identify the half way point of the bad part of the circuit (above), then, make another check at this point. This technique rapidly reduces the size of the problem with each step. Finally, you will reach a point where the problem is easy to identify as you can locate a very specific area (for example, a junction block) where the problem has to exist. This technique is very powerful and can be applied to any circuit. Open circuits are identified normally by a loss of power. This can be easily checked with a voltmeter or test-lamp via an open-circuit test. Generally the voltmeter has the advantage that it does not damage any sensitive components but it cannot identify a high resistance in an unloaded circuit. That is, the voltmeter tells you that a connection exists which can supply the voltage, not how good that connection is! An ohmmeter can also to used to check for open circuits but the circuit or component must be completely un-powered. Also, low resistances cannot be tested effectively with a ohmmeter. Short circuits are where a direct path to ground exists, In an electrical circuit the current will always take the easiest path, if this happens the circuit is overloaded and (hopefully) a fuse (or other protection device )will operate and protect the circuit. Short circuit detectors are available that switch the fault current on and off in the circuit (they are fitted in place of the blown fuse). It is then possible to identify the position of the fault using a compass or inductive ammeter. This means that it is possible to locate the fault without removing trim. The problem is that a high current still flows momentarily and thus, if the wire in the faulty circuit is a small size, it can still overheat. A better solution is to use a high-wattage bulb (>21w), this will not overload the circuit but the intensity of the lamp allows you to distinguish a dead short from the normal circuit current. This method is particularly useful for tracing intermittent faults. Examining the fuse can give information about the nature of the fault. If the fuse has ‘blown’ then a dead short exists. If it has overheated then an overload has occurred (a faulty component?). If it has just fractured then the fuse itself could have fatigued and failed with no specific circuit fault. Parasitic loads are current drawn whilst the vehicle is standing inoperative. Most vehicles have a small, standing current draw due to electronic components (~50mA) but more than this will flatten the battery over an extended period of say, a few days. In order to isolate a load of this kind an ammeter must be connected in circuit with the battery. By removing the fuses one-by-one of all the components which draw a quiescent current (quiescent = being in a state of repose; at rest; still; not moving) can be identified and eliminated, as once the offending circuit component fuse is disconnected, the drop in current draw will be seen at the ammeter. It is then possible to follow this current draw via the wiring system by disconnecting at appropriate wiring junctions, in this way the circuit component can be isolated. Volt drop testing is a dynamic test of the circuit under operating conditions and is a very reliable way of determining the integrity of the circuit and its components. With this technique, problem resistances in circuits which carry a significant current ( >3amps) can be clearly identified. For these circuits, even a resistance of 1 ohm can cause a problem (remember that V =IR, therefore a resistance of 1 ohm in a circuit carrying 3 amps will drop 3 volts across the resistance, that is 25% of the available voltage for a 12 volt system). Because the test is done whilst the circuit is operating, factors such as current flow and heating effect will be apparent. To test for volt drop, the voltmeter is placed in parallel with the circuit section to be tested. During operation of the circuit, any unwanted resistance will show as a voltage reading. In general, not more than 10% of the system voltage should be dropped between the source (the battery) and the consumer (the load). Voltage drop measurements should be carried out on return (earth) as well as the supply side of the circuit and generally voltage dropped on the earth side should be lower. Remember that many chassis and body system components now use the same communication methods and techniques to share information as Powertrain systems (e.g. CAN, LIN) and operate on the same network. Body and Chassis Diagnostic Trouble Codes (DTC’s) are defined in the OBD protocol standard and hence there is much useful information to be gained when troubleshooting by exploiting the OBD functionality. Generally, Powertrain codes start with a P, Body and Chassis codes start with a B and C respectively. For more sophisticated control systems, accessing the DTC’s should be the first step in a diagnostic procedure. In many systems, this will be the only way to start fault finding as the system and it’s components are so complex. Try to employ a logical approach to your fault finding, this prevents wasting time and replacement of unnecessary components. Try to familiarise yourself with the system and attempt to understand how the system works (assuming the information is available) this allows you to use your time more efficiently and effectively. Use a heuristic approach, use your experience with similar problems or scenarios to optimise the use of your time dealing with the current problem in hand. Always take the path of least resistance, test or check the components that are easiest to access first to prevent wasted time removing trim unnecessarily. Never overlook the obvious, never assume anything, always check things out for yourself. Assume everybody else is an idiot and make your own checks to ensure that you always have the correct information during your investigation process. When dealing with intermittent problems take a strategic approach, even though the systems can be complex there is no magic. If something doesn't work there is a reason, also problems don’t fix themselves, try to get to the root of the problem, if you don’t it will come back!